3 easy hors d'oeuvres for your next dinner party! As an event stylist and dinner party aficionado, I have done quite a few dinner parties both for my business and for myself. There are a few hors d'oeuvres that I can't do without and they make any dinner party look pretty spectacular! Dinner parties to me are the epitome of cool; I mean who doesn't love a reason to get dressed up and hang out with some of your favourite people for an evening? How to style your next dinner party! 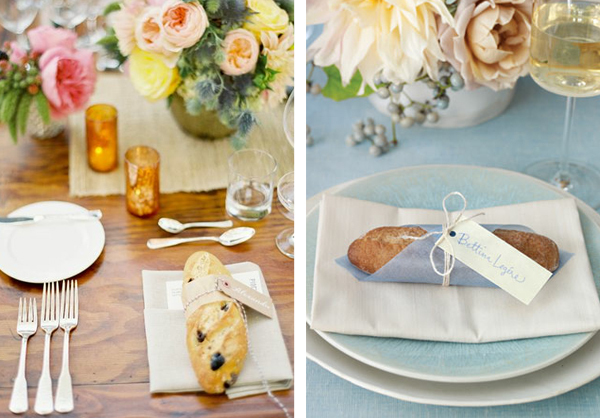 Place settings that are super chic & super easy! Being an event stylist and creating events for every kind of occasion, I've scoured magazines, books, blogs and pinterest for some of the best, most innovative and unique ideas on how to set the table. There are a few that really stand out and have become my go-to ideas when hosting a quick get together, party or major event. I've broken each of my favourites into 3 categories: Dinner Party, Wedding and Holiday. Below you'll find a few of my ideas on how to set the table, design a place-setting for a wedding or just make your dinner look gorgeous! This is one of the easiest and oldest tricks in the book! Not only does placing a little sprig of something green look elegant, it smells wonderful and can also be a signal to guests as to what's to come... can we say Rosemary Roasted Chicken.... Yum! What's better than a well-styled place-setting? An edible place setting! Can it get any better than a cute mini baguette, that looks pretty and acts an appetizer? I don't think so! Check out these 3 great examples. This is a classic and timeless place-setting accent. Who doesn't love a little bit of lovely on their plate. The best part about it? Flowers come in all shapes, sizes and colours, so your table can look different with just a little tweaking of the blooms! heck out some of my favourites below! Well, those are just a few of my favourite place settings and some inspiration for your future events. As always contact us for expert advice on how to make your event, wedding or dinner party amazing and unforgettable! Psst....Stay Tuned for our next blog post on 4 ways to make your dinner party look homemade!